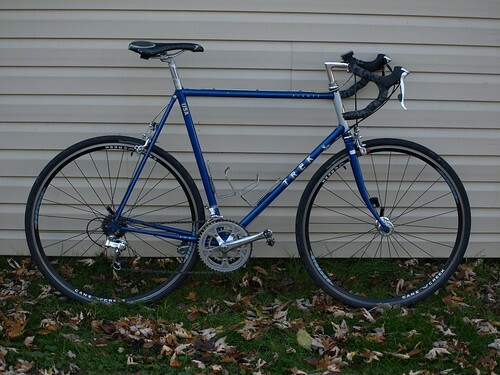 I've got a very nice, little-used '86 Trek Elance 400. It's equipped w/ all Shimano; the wheels are the original Matrix rims, and the components are Shimano Light Action. I just think she's due for an upgrade. Specifically, the bike feels fairly back-heavy, esp. considering the Reynolds 531 frame. (I do have to carry it up and down the stairs to pull it out of my apt. basement, and it's kind of a pain--not so much the weight itself as the differential betw. back and front.) Wondering if I might lighten the rear w/ a change of gears and RD. I have a Suntour Superbe RD, as well as a Campy Victory RD. Would either of these be an improvement over the Light Action? I read in an archived thread where T-Mar noted that the Light Action derailleurs were prone to breakage. As I think of it, I'm guess the Campy won't be compatible w/ the freewheel I have on there now. Should I get a nicer FD? This bike is my utilitarian bike. It's not a beater, b/c I take good care of it, but since I'm in the city, I can't afford to have more than this and my fixed gear beater. But I ride this everywhere--short and long rides, so I'm going for utility and durability above all else. You wouldn't happen to be carrying it upstairs with a chain and lock on it would you? You'll sacrifice durability for weight savings - not the best option for a NYC commuter. To make the rear feel lighter, get a lighter rear wheel, lighter tires, lighter saddle, aluminum or titanium freewheel, and a lighter bottom bracket. I doubt you'd save much weight with a different RD. The Shimano on there is fairly light anyway, isn't it? You could go with a tighter ratio freewheel to reduce some the weight if you don't need the low gears. Also, I'm pretty sure the 400 Elance is 531 in the main tubes only. The rear triangle is likely a heavier gauge chromoly. Last edited by JunkYardBike; 08-08-08 at 01:47 PM. I doubt you'd save much weight with a different RD. The Shimano on there is fairly light anyway, isn't it? You could go with a tighter ration freewheel to reduce some the weight if you don't need the low gears. And to add to your question concerning brakes.......You can get dual pivot in a long reach. Tektro makes one. The model # is 6556. VeloOrange sells them and they are constantly on ebay. Just make sure you know the reach needed before ordering. The Nashbar Long Reach Brakes will work, as well. That's what is on my 86 Trek 400. Think you're right about the main triangle/seat & chainstays. Only reason I thought about the RD/gears is b/c I recently saw an elance 330 from the same year ('86) w/ a Suntour Alpha-3000 RD on there, and it actually seemed a bit lighter in the back. But maybe that was just the colors playing tricks on me . I'm also not as worried about durability as most, as I'm a very very skinny dude at 120 lbs. I can get away w/ more weight shaving than most. But I'll take your point about the RD. Nonetheless, should I be worried about the breakage issue? Would it be stupid to switch out the gruppo? I think I have a cycloneII lying around, as well. I'm eventually planning on adding some 650b wheels--for improving the fit of the bike and as a general wheel upgrade. *If you have to run long reach brakes now. What are you going to do when you slap 650b's on that thing? Lace a drum brake up front and a drum or coaster brake hub out back? Get canti bosses added to the frame and a re-paint? *How is adding 650b's gonna improve the fit? You'll end up with shorter cranks to avoid pedal strike (maybe good...maybe bad fit wise depending on leg length and riding style)....The only improvement will be in stand over height. If the bike fits now it's not gonna fit any better with a wheel swap. A wise man once said: "You're supposed to ride that bike not stand over it". Every road bike I have that actually fit's well is not comfy to the boys to stand over flat footed. I agree, not sure how it's going to improve fit, but the main purpose of 650B's, I think, is to accommodate fat, fat tires, which will probably bring the standover to something equivalent to what it was with 700c and narrower tires. See your thread on Japanese randonneuring bikes. Last edited by JunkYardBike; 08-08-08 at 08:17 PM. If you are running non-aero brake levers, changing to aero levers will be an improvement. Better pads, as you mention, too. Changing the derailleurs, in my opinion, won't make a noticeable difference unless something is wrong with the current ones. You want a light NYC commuter, go singlespeed, or even better, learn to ride fixed and lose the rear brake too. That's your carry-up-the-stairway bike. Looks like he's already got one of those. That's true but.......It can go either way depending on the frames ability to run huge tires or not........Got to leave room for fenders right? It also lowers the top tube, possibly making a bike safely usable for a shorter rider than would otherwise fit it, due to lack of standover clearance. If you are going from a very narrow 622 (700C) tire to a fairly wide 584 (650B), the difference may be minimal. For instance, the outside diameter of a 19-622 (700 x 19C) tire would theoretically be exactly the same as a 38-584 (650 x 38B). " There is a but in that comment...Competeley dependent on how huge a tire you can fit in there and how high the bottom bracket is with 700c's. "Step One: Measure the DROP. Wheel radius minus BB height is DROP. Ideal is 64 to 68mm. If it's 70mm or more, don't do it, because you won't have enough pedal clearance (for our taste; if you don't mind scraping pedals...forge on ahead)"
The perfect frame would be one that used 700c with short reach brakes, has a high bottom bracket and wide enough chainstays and fork crown to accommodate 38+mm tires. You would be able to fudge some numbers a bit with shorter cranks but that could affect fit depending on how sensitive you are to crank length changes. I've tried 3 different frames myself and have never been happy with the 1" of pedal clearance so the search continues......Just sayin' it's not as easy as just swapping in some 650b's on any ol' frame that's laying around. Sorry for the winded post. Okay, thanks for the feedback. The main reason I want to slap on the 650b wheels is exactly for the reasons guessed at: I'd like to drop the entire frame a bit. Every 22" frame I get on that's made for 700c wheels hits me at a point where I can ride, but where I'd prefer to have a bit more space. Additionally, I would like to upgrade the wheels on this, and 650b just seems my thing; the porteur/randonneur bike also just seems my thing. I also like the aesthetic. I figure if I'm going to upgrade the wheels, I may as well turn this into my personal dream bike. Oh, and b/c I'm fairly light, I actually planning on running fairly narrow 650b tires. I figure I may as well turn my skinniness to my advantage in situations when I can--like tricking out a bike . I know all the drawbacks to 650b's, most especially the issues w/ availability and flats and and...I'm willing to take the risk. I've actually never suffered a flat (knock on wood), even though I've practiced changing innertubes over and over so I could be quick about it. Oh, and to clarify, I'll only need the long-reach brakes once I put the 650bs on there--w/ the original wheels, the reach is nothing out of the ordinary (though it's a touring frame, so there is room for fenders as-is). Finally, one of the reasons I was contemplating the derailleur swap was that I just have the SunTours lying around, I kind of like SunTours better, and since I have a Superbe and a Cyclone and I've heard such good things about them, I figured I'd give it a whirl. Seems the general consensus is that an upgrade of the RD won't have much positive effect, so I'll skip it, though no one has specifically expounded upon the query I put out there about the failures of Light Action derailleurs. Sheldon Brown mentioned in one of his articles that newer FDs can represent big improvements, however--anyone care to comment on that? I guess I'll just go w/ upgrading the brake pads, maybe think about swapping the bars, and keep the fenders I have on there; also, I'll concentrate on adding a rack and some small luggage. And I'll just keep saving for the wheel upgrade. Thanks for the advice. I'll leave the drivetrain as is until it's time for new wheels. Maybe it'd be more interesting to just ask, "If it were 1988-1990 and your brother or dad had just given you his few-years-old Trek, and you wanted to upgrade it a bit, what would you swap in/out?" Seems like the consensus is, brake pads, wheels, brakes...way lower on the list, derailleurs/drivetrain stuff. Rupster--thanks for the pic. Those are 650b wheels on there? I also see you have upgraded to what, 8-speed? 9-speed? That's exactly the change I'm looking for--just the slight drop in standover height and slightly larger tires. Aren't we all looking to make that perfect, personalized bike? Last edited by peripatetic; 08-09-08 at 02:39 AM. No, the wheels are 700c, just a bit lighter than stock. I think it has 28s in the picture. It will fit 32s w/fenders & about 35s without. The drivetrain is 9sp: Tiagra shifters, Tiagra (4550) compact crank (I added since the picture), Sora front derailleur, original Light Action rear derailleur. I ran bar end shifters and aero levers for awhile, but found a good deal on the Tiagra shifters. thought I'd share a pretty free spirit.